I just got the new book Everyday Grain-Free Baking in the mail a few weeks ago, and ever since it’s been the cookbook I hand to my kids to choose a recipe on our Saturday baking day tradition. Most recipes are GAPS-legal, and if they’re not, there are simple substitutes or omissions that can be made. I especially love that they call for ingredients I almost always have on hand – coconut and almond flour are used, but those are in most grain-free kitchens anyway. The recipes are simple to follow and delicious. So far we’ve tried these biscuits and the cinnamon-swirl coffee cake with great success! 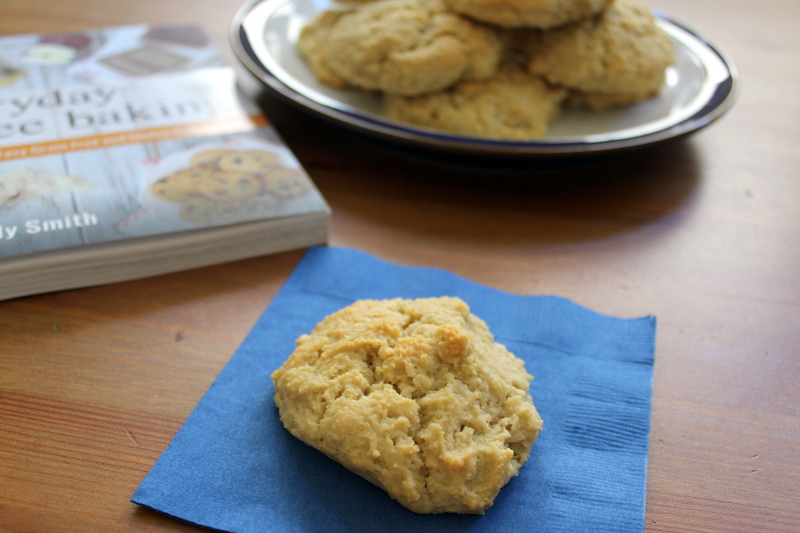 Kelly offered to let me share the biscuit recipe with my readers, so here it is. Thanks Kelly! Make sure you click on over here and check out the rest of the recipes in her Everyday Grain-Free Baking book. 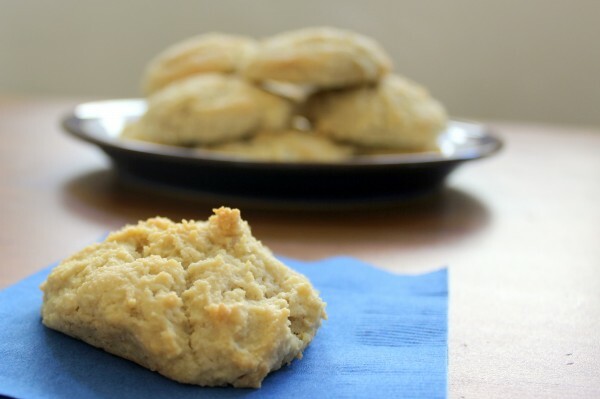 These fluffy almond flour biscuits are low carb and quick to whip up in the morning! Enjoy alongside soup, or topped with a poached egg and crisp bacon for a breakfast treat! n a small bowl, combine almond flour, baking soda, and salt. In a medium bowl, whisk together melted butter and honey until smooth. Add the coconut milk, eggs, and apple cider vinegar, whisking together until well combined. Using a spoon, stir the dry mixture into the wet mixture until thoroughly combined. Bake about 15 minutes, until golden brown on top and a toothpick inserted into center comes out clean. Serve warm with a drizzle of raw honey or homemade jam. I was wondering what would be a good substitute for eggs? Also, if I cannot find almond flour, can almond meal or coconut flour be used? You can make an egg replacement using 1 Tbsp. ground flax seeds mixed with 3 Tbsps. of water. Stir well and let it sit for a little while, and it becomes a similar consistency to an egg. We have to avoid dairy and eggs, so I’ve found it helpful to look for vegan recipes when wanting to make baked goods. And then I use paleo/gaps style meals for lunches and dinners. I hope this helps! I’m looking forward to making this recipe. I want bread all the time, any kind. It’s do good to eat a healthy bread that I know is gluten free. 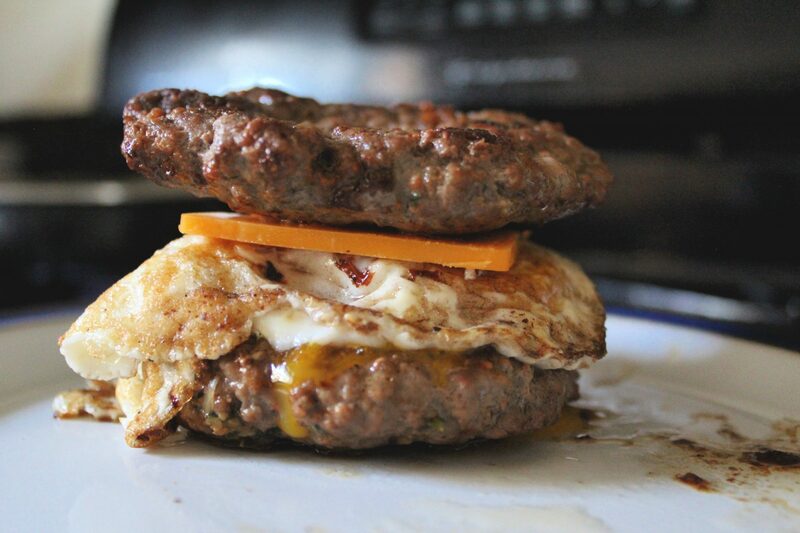 Thanks so much for posting this recipe. I will look for this cookbook. Is the coconut milk in this recipe the canned kind that is thick or the liquid kind you can buy in the refrigerator section at the store? I believe either would work, I used the full-fat canned kind. Cara, I’ve been receiving your e-mails for quite sometime. I have had gut problems my WHOLE life and no one could ever put their finger on it. After reading an article you wrote, passed a long to me by a friend. I was intrigued. My doc (an integrated physician-LOVE HIM!) suggested a gluten-free diet, which was helping somewhat but I was still having problems. I’ve now been grain-free and sugar-free for 9 months and feel better than I have in years. Not only my gut, but my sleep patterns, my focus and it’s just because of diet! WOW! All that to say, I love your recipes. They’ve really helped. I especially loved the one awhile back – the meatloaf cupcakes with avacado frosting. I make it all the time. THANK YOU SO MUCH!! !